Tiny Little Tart Golden Sour, the first beer of our Small Release Series launches today! Tiny Little Tart is a Kettle Sour that is dry hopped with Equanot & Idaho 7 hops, which accentuates its beautiful bouquet of passion fruit & citrus. Available in limited quantities starting today at Hearthstone, Pacific Liquor Store, Bottle Jockey Burnaby, Tobys Commercial, Highpoint Beer Wine and Spirits, Cedar Cottage Pub, Jake’s Liquor 8th Street Liquor, Paddlewheeler Liqour Store, South Point Liquor, Clayton Liquor Store, 1st Avenue Liquor Store, Central City Liqour Store O’Hares Liquor Store, Broadway Liquor Store, Steamworks Liqour Store, Marine Gateway Liquor Store, Darby’s Liqour Store, Firefly Wines and Ales Vancouver, Legacy Liquor Store False Creek, The Gull Liquor Store, North Shore Liqour Store, Merchants Oyster Bar, Dollarton Liquor Store, Scotties Liquor Store, Edgemont Liquor Shop, Burrard Liquor Store, South Van Liquor Store, Lynn Valley BC Liquor Store, Golden Ears Liquor Store, Newport Liquor Store, Westcoast Liquor Company on Fraser. Sign up for the Springs Group newsletter to get the latest updates, promos, in-store contests, products and more! [post_content] => Hearthstone Brewery is proud to be partnering with CRAFT Beer Market Vancouver for a collaboration dinner on March 28th, 2017. If you enjoy great beer paired with fresh local food, this is an event you do not want to miss! 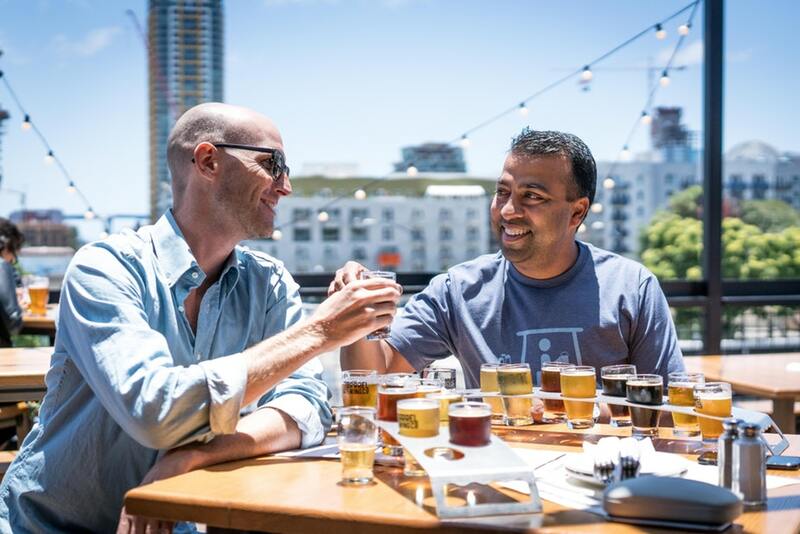 Your ticket includes a welcome beer, plus four courses each paired with a Hearthstone beer. Please note that this is a set menu! If you have any allergies or dietary restrictions, please e-mail us BEFORE purchasing a ticket here. Limited tickets available for $60 (taxes and gratuity included). A clean, crisp golden pale pilsner with a spicy, floral hop aroma. Polish Marynka and Saaz hops are the driving force in this brew's hop character, resulting in a balanced, yet complex Pils. Lighter than your average IPA, these Amarillo and El Dorado hops steal the show. The result is stone fruit, citrus and all around tropical hoppy goodness. A full bodied red ale where the malt and hops battle it out creating a beautifully balanced brew. On the nose Citra hop aroma, hop spice from the Galena on the tip of your tongue, big caramel notes on the after palate, bitter finish. This dark and broody milk stout is full-bodied and perfect to cuddle up next to a fire with. A solid and robust drink that has been aged on cacao nibs and shells provided by the East Van Roasting Company. Kettle soured, then fermented with our house ale yeast. Next, we dry hop the hell out of this beer with Equanot and Idaho 7 hops, both accentuating the beautiful bouquet of passion fruit and citrus. [post_content] => Hearthstone Brewery's second Small Release Series Beer Atlantic Pale Ale hits shelves today! Atlantic Pale Ale is our take on an English style pale ale - light in colour and body, hopped with a mix of Old World and North American hops, resulting in a balanced and refined pale ale. Get some before it's all gone! Available in limited quantities starting today at Hearthstone, Pacific Liquor Store,  Bottle Jockey Burnaby, Tobys Commercial, Highpoint Beer Wine and Spirits, Cedar Cottage Pub, Jake's Liquor 8th Street Liquor, Paddlewheeler Liqour Store, South Point Liquor, Clayton Liquor Store, 1st Avenue Liquor Store, Central City Liqour Store O'Hares Liquor Store, Broadway Liquor Store, Steamworks Liqour Store, Marine Gateway Liquor Store, Darby's Liqour Store, Firefly Wines and Ales Vancouver, Legacy Liquor Store False Creek, The Gull Liquor Store, North Shore Liqour Store, John B Liqour Store, Dollarton Liquor Store, Scotties Liquor Store, Edgemont Liquor Shop, Burrard Liquor Store, South Van Liquor Store, Lynn Valley BC Liquor Store, Golden Ears Liquor Store, Newport Liquor Store, Westcoast Liquor Company on Fraser. On May 12th our next Small Release Beer will be released to select stores. Check out our social media to see more about what's coming next. [post_content] => You may be thinking mushroom beer.... that's strange. Mr Fungi Black Lager doesn’t taste like the mushroom soup you might be picturing in your head; it taste like a black lager with a notes of Chaga, a complex earthy/coffee/mocha flavour. The goal with our black lager was to use Chaga, a locally foraged superfood, to impart colour and flavour for an interesting and complex subtle Chaga taste in our black lager. The result is a delicious black lager with earthy/coffee/mocha notes from the Chaga. Try it and see what the flavour is yourself (we recommend it be your first beer of the session as the flavour is subtle). [post_content] => With the Fall season upon us and the holiday season quickly approaching, we thought we would help you get in the, um, spirit. So let us help you celebrate by showcasing some of our special festive drinks now available at all our super wicked liquor stores. From our beer to our wine and hard alcohol, we have options for everyone looking to spice things up the next coming weeks. We hope these drinks help you have an amazing Fall and holiday season! Trick or treat? Both! 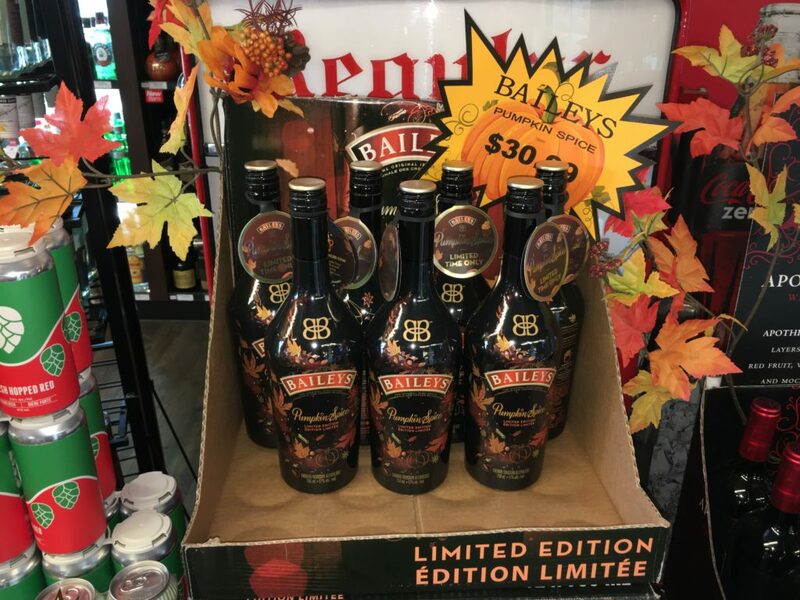 Most of us have maybe tried the original Baileys, but this limited edition pumpkin spiced Baileys is sure to catch eyes and tickle taste buds. Bring one of these unique bottles home today. 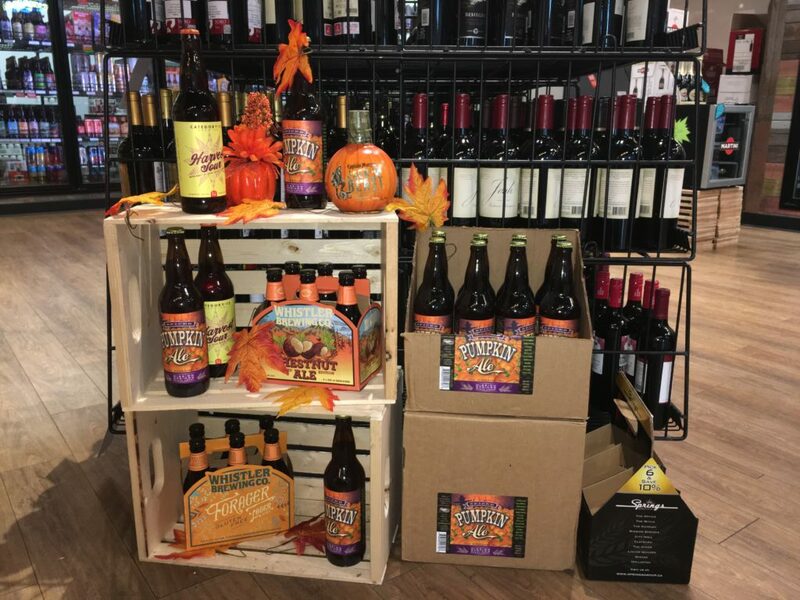 We have a wide selection of seasonal beers that are sure to get you in the Fall spirit. From our Pumpkin Ale and Chestnut Ale, to our Harvest Sour, Forager Lager and more - we have something for all kind of beer lovers to enjoy. Pick some seasonal beers up to try today! If you like salted caramel, you definitely have to try this salted caramel porter beer. From the Old Yale brand, this Himalayan Salted Caramel Porter is both sweet and refreshing, but still has a kick! Try some today. 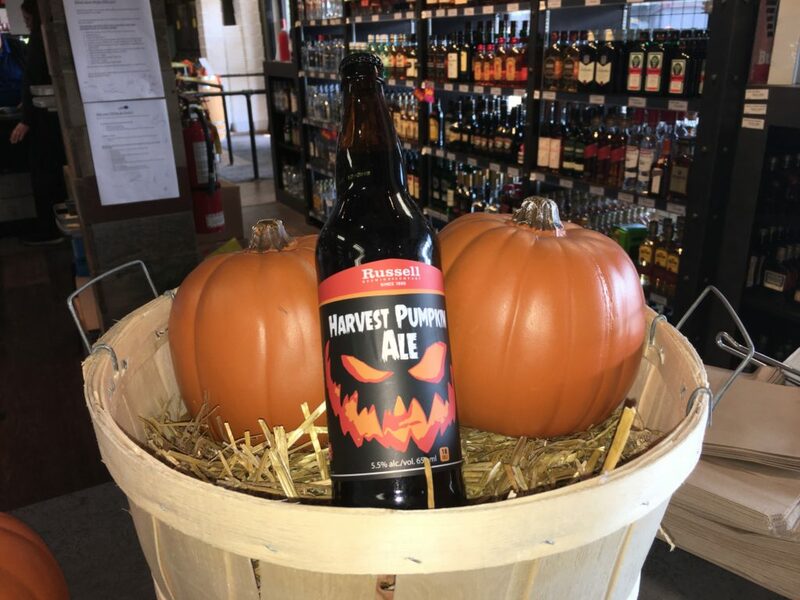 If you're still looking for more pumpkin Ales, here are 2 more to choose from. Both of these beers have a flavorful pumpkin taste to them, while maintaining the smoothness that is expected from Ales. Try one (or both) today! 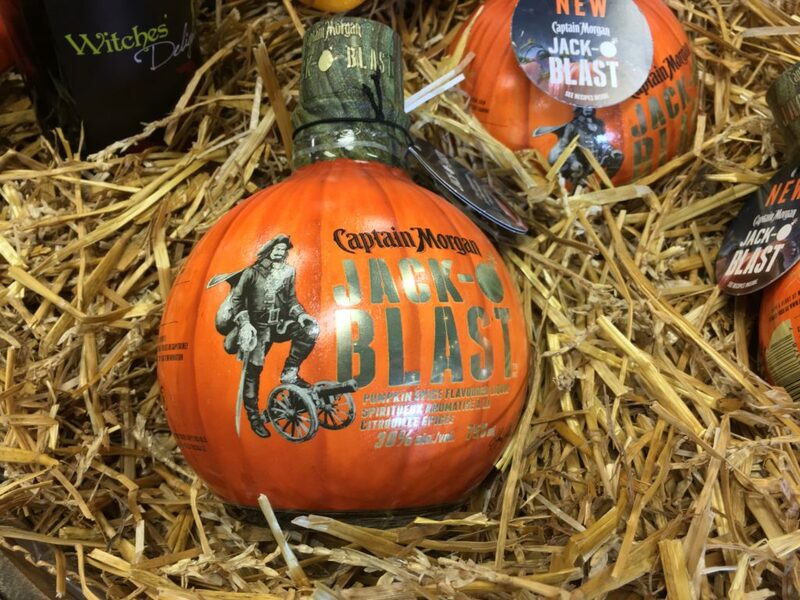 If you're looking for something with a bit more "kick" to it and are also a rum lover, these Captain Morgan Jack-O Blasts are the perfect distraction to help you get into the festive Fall spirit. That's right, we said Jack-O Blast! Now you say it, out loud to whomever is beside you. These pumpkin'y flavoured cannons explode with flavour when you lob an ounce into any drink. Check out this delectable Pumpkin Spiced White Russian!. 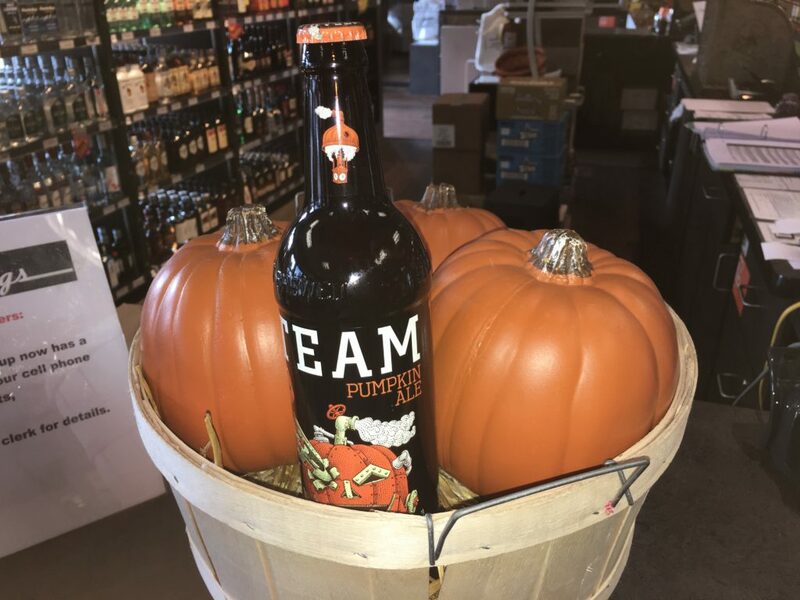 This  fun and bright pumpkin-shaped bottle can also act as a decoration for your home! Pick one (or more) up today. Who knew salted caramel and whisky could make such a great pair? Add some sweetness to your whisky or make some salted caramel eggnog with this unique drink. 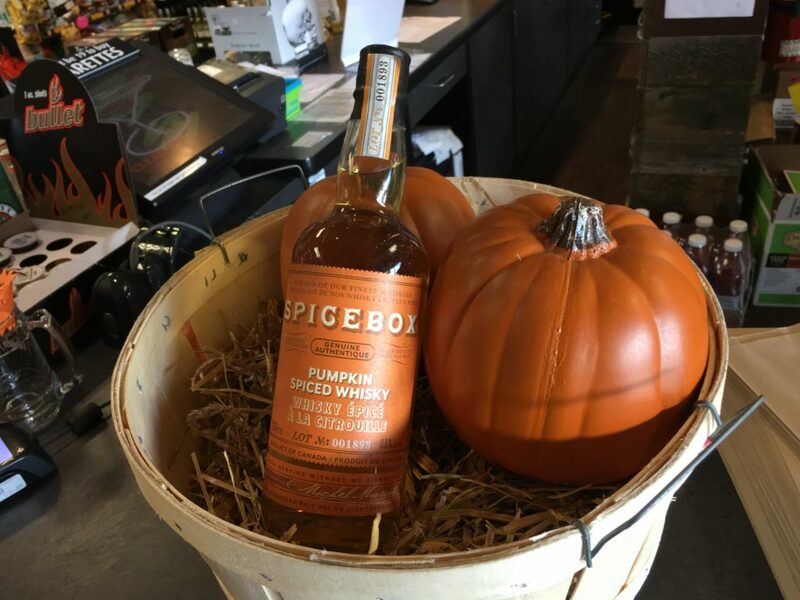 If you're a whisky fan and looking for a twist (but not much of a salted caramel fan), then this Spicebox Pumpkin Spiced Whisky may be just for you! Holding it's original strong and flavorful whisky taste, but adding a hint of pumpkin sweetness, this drink is bound to warm you up right for the holidays. It's never too early to start getting into the Christmas/holiday spirit... right? 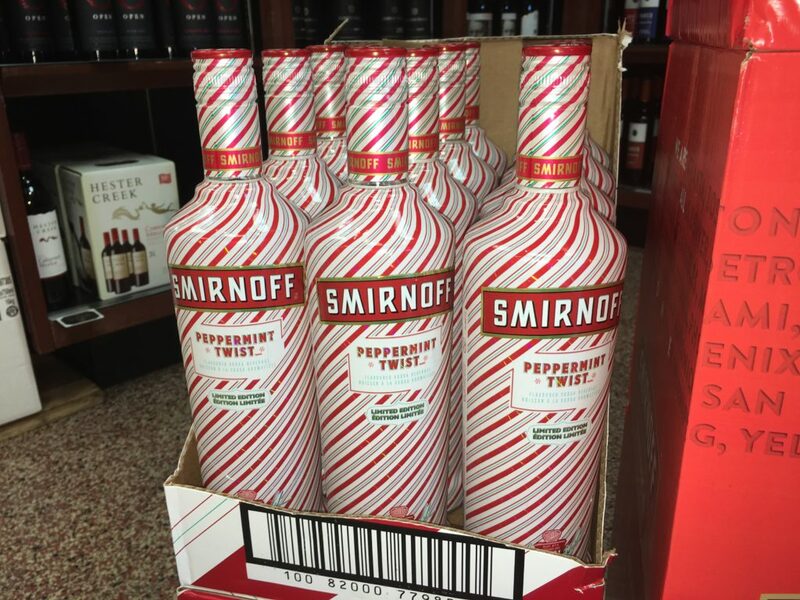 If you agree, and you're not seething with rage at the thought of creepy mall Santa's, then this limited edition Smirnoff Peppermint Twist Vodka may be your perfect ally. Pick one up to start celebrating the holidays today! It's sure to annoy your friends. 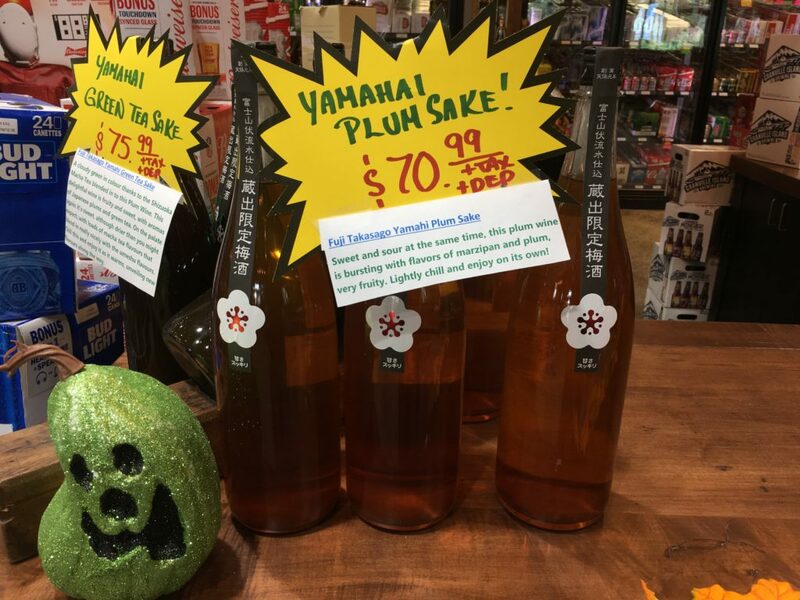 Anyone who enjoys a nice sake should definitely be intrigued by this Yamahai Plum Sake! This plum and marzipan flavored Sake is both sweet and sour. A very nice twist to the already flavorful traditional Sake. If you're more of a wine drinker and are looking for something different to bring home this Fall & holiday season, check-out this "his and hers" Halloween-themed wine combo. 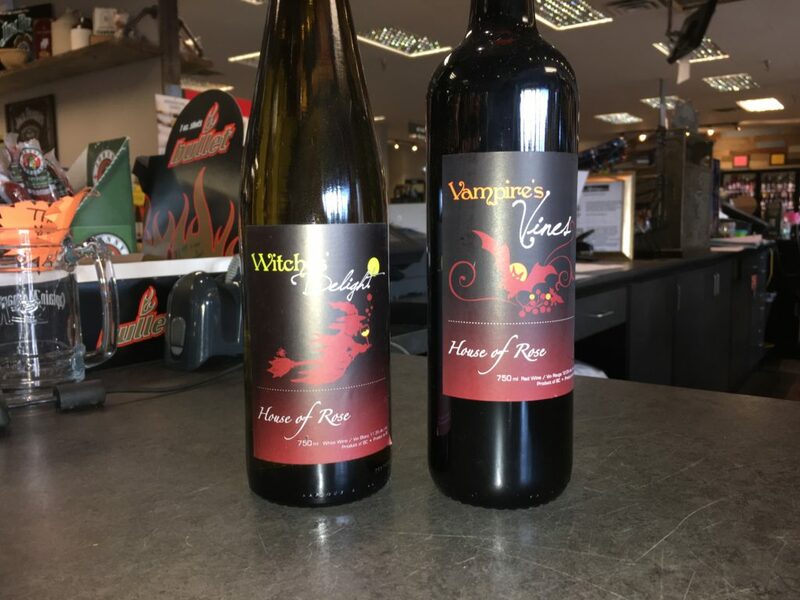 With both a white wine and a red wine to choose from, these wines from House Of Rose are great for both witches and vampires. Which one are you? 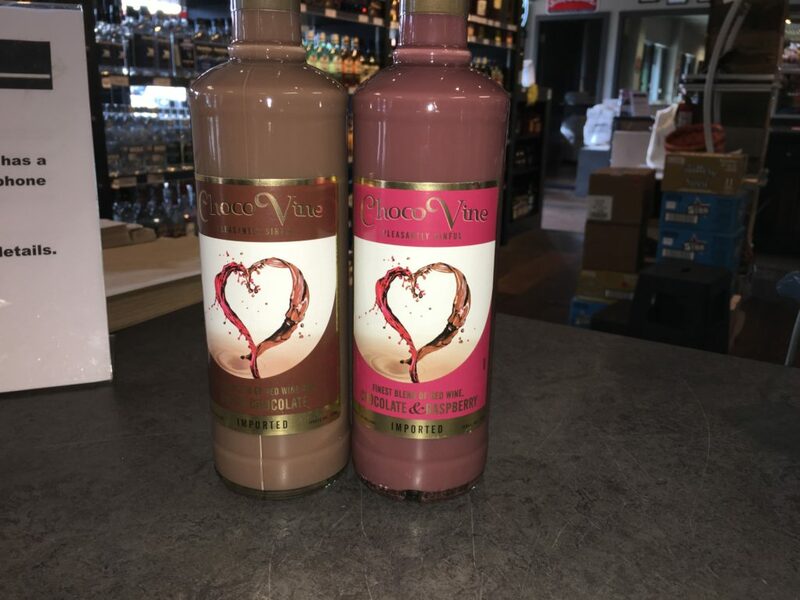 Possibly seen as another "his and hers" wine combination option, these ChocoVine wines almost seem like a dessert! You can choose from the original chocolate flavored wine, but we also have a chocolate & raspberry wine to choose from too. Try one (or both) tonight! Happy Halloween, and Happy Holidays! From all of us here at our Springs Group liquor stores and brew pubs/restaurants, we wish you a very happy Halloween and a happy holidays! We hope the seasonal drinks featured above helps get you in the festive spirit. Visit One Of Our Liquor Stores Today! 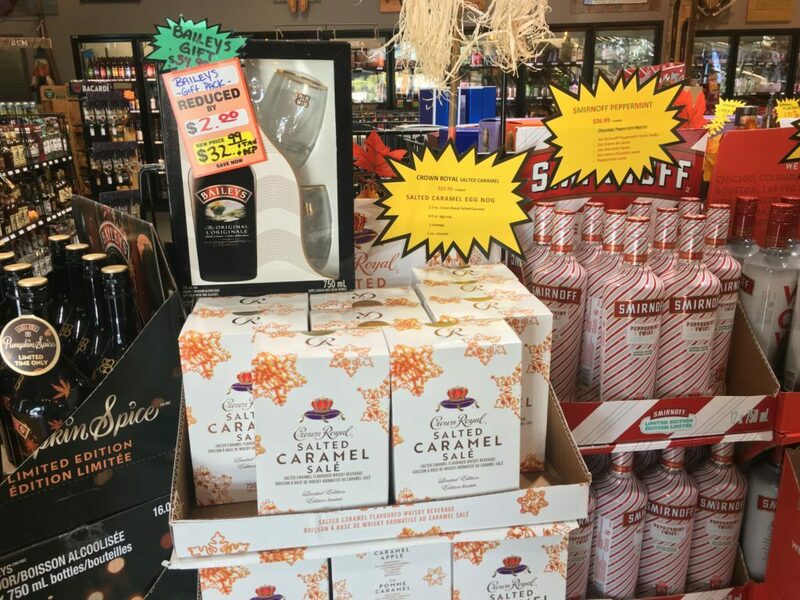 [post_content] => The holiday season is upon us, and with Christmas right around the corner, our Lower Mainland liquor store locations are looking jolly and festive. 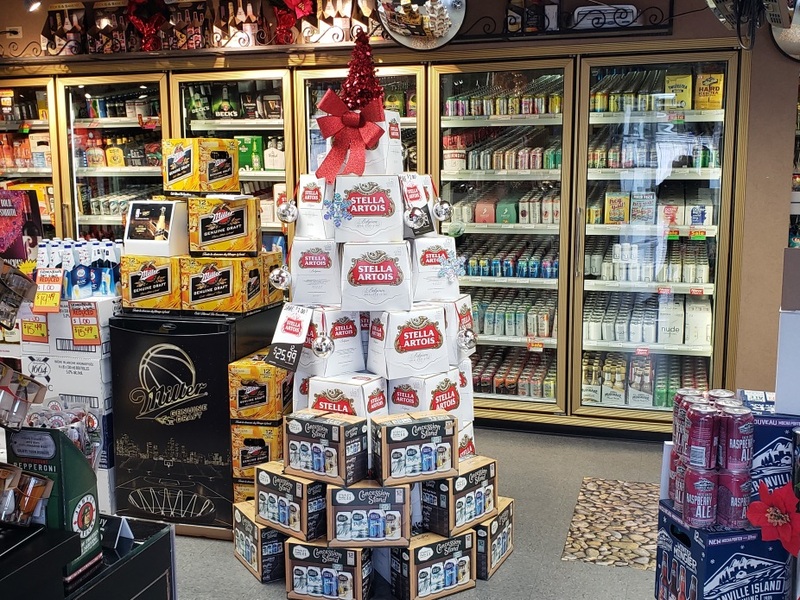 We have decorated our liquor stores with "Christmas trees" built out of holiday Stella Artois 12-bottle packs! We also have Springs Group Gift Cards and Springs Group "VIP cards" available for the holidays, as well as updated holiday hours, a new holiday beer promotion, and more. *Every other day we are open from 9:00AM to 11:00PM! Our New Holiday Special Beer Promotions! We have new holiday special beer promotions going on this season! 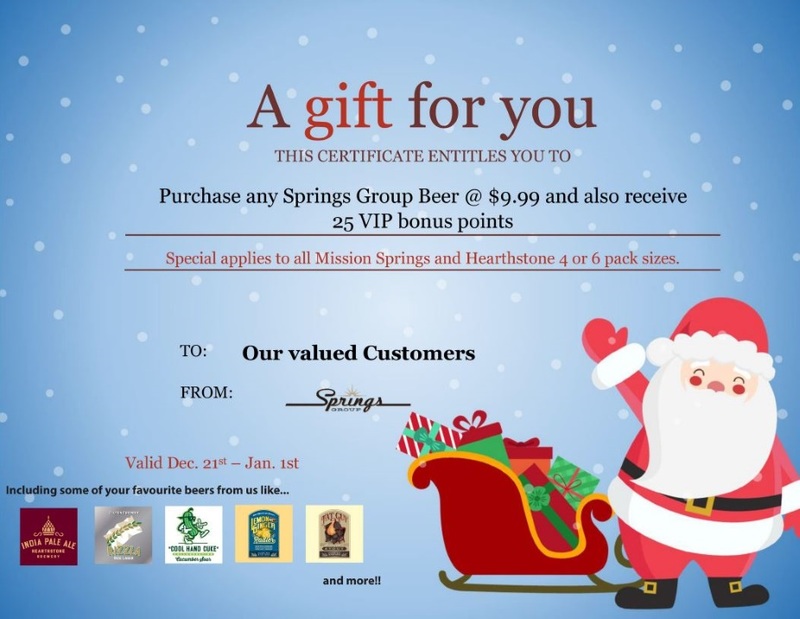 All of our Mission Springs beers and Hearthstone beers (4 or 6 pack) are on sale for $9.99 from December 21st to January 1st. You will also earn 25 VIP bonus points! See below for more info on our gift cards and VIP cards. 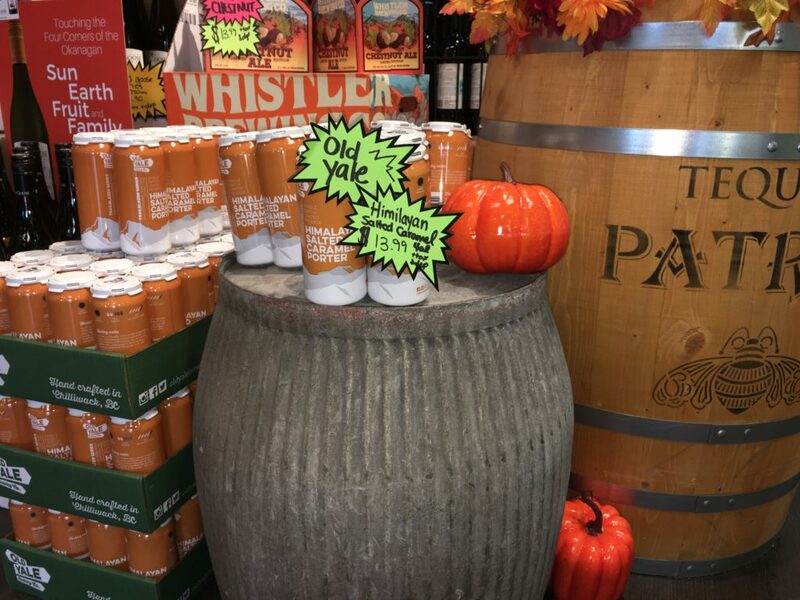 Stop by any of our liquor store locations to pick-up some of these delicious beers and take advantage of the sale promotion today! Right now all of our Stella Artois 12-bottle packs are also on sale, for $2 off. They come with a free Christmas tree ornament too! 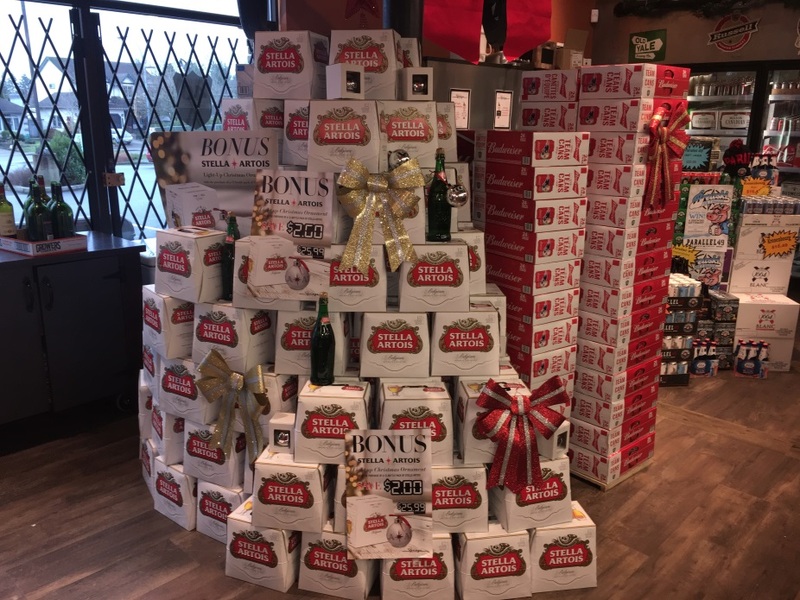 See further below for pictures of some of the "Christmas tree" displays that our liquor store locations have built out of the 12-bottle packs of Stella and the free ornaments! All of our stores are scheduled to have tastings on the weekends in the later afternoons / early evenings (usually from 3pm-7pm)! This is going on up until the new year, so make sure to come by on the weekend for some of our awesome tasting events! Take Advantage of Springs Group Gift Cards & VIP Cards! If you didn't know already, we have Springs Group gift cards as well as Springs Groups "VIP Cards" that can be utilized. Learn more about each of these cards below. 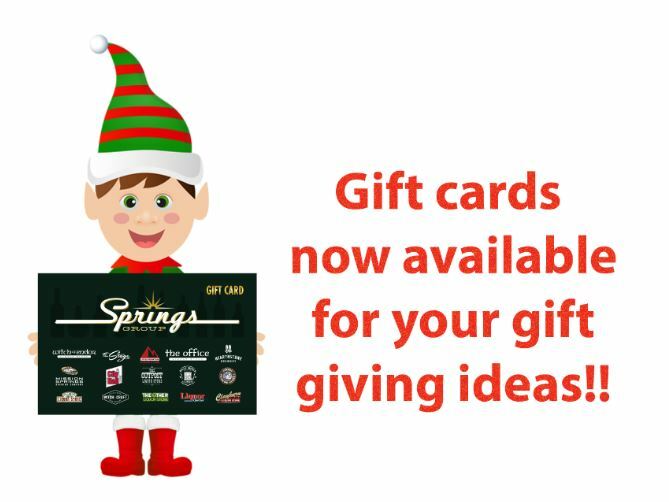 Giving a Springs Group Gift Card as a gift this holiday season allows the receiver to use the gift card funds at any of our liquor store, restaurant or pub locations! With a variety of drink and food options available, a Springs Group gift card is bound to satisfy anyone who receives it! 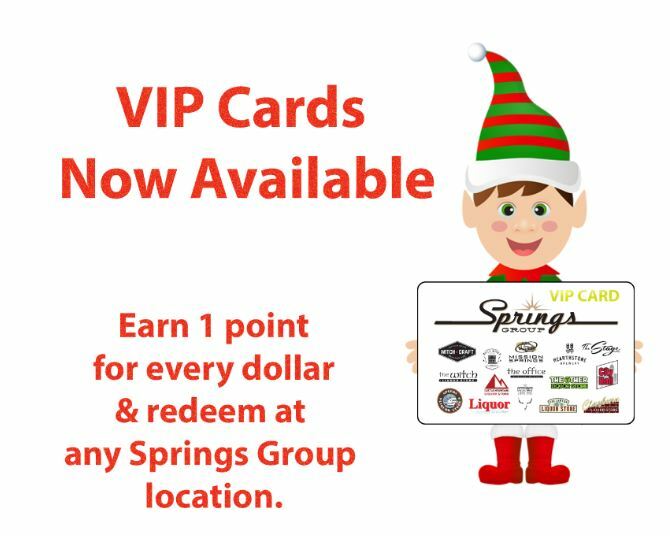 You can get yourself a Springs Group VIP Card which gives users the ability to earn and redeem 1 point for every dollar spent! Our VIP cards are now available, and they work universally at any of our locations! Speak to a rep at one of our locations for more information. 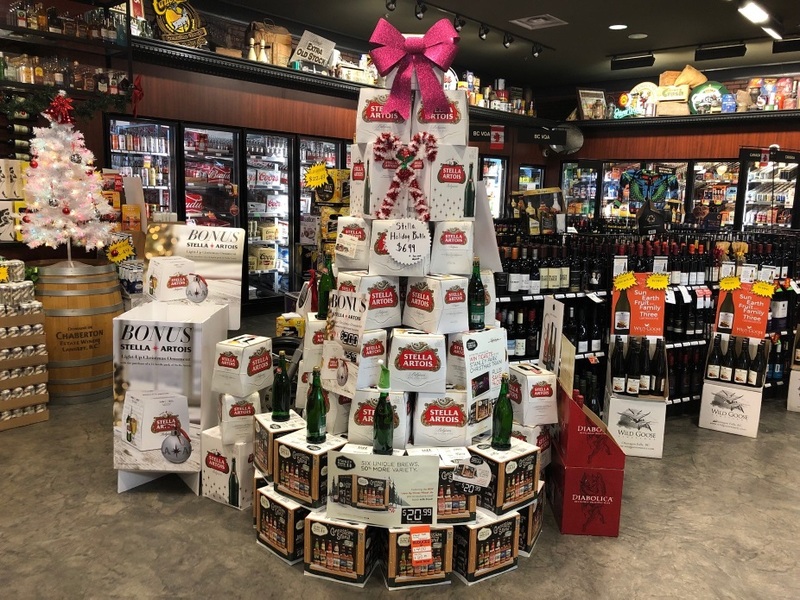 Below are a few pictures that we took of some of our favorite festive Stella Artois Christmas tree displays that are now up at our liquor stores. These holiday-themed Stella Artois 12-packs come with a free bonus for the holiday season in the form of a free light-up Christmas ornament! 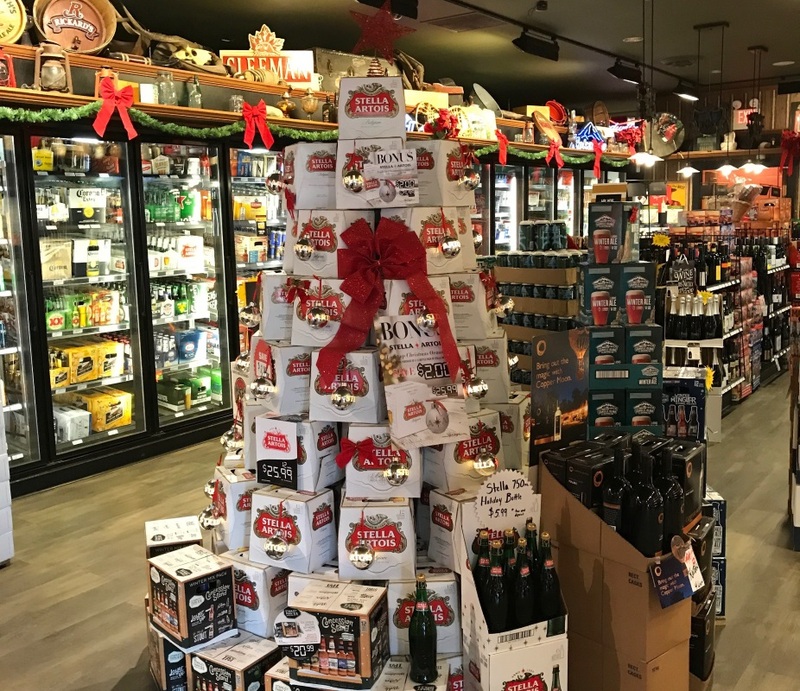 See below for the Stella Artois Christmas tree displays at our liquor stores, & visit one of our locations today to get your Stella Artois 12-pack & the bonus light-up ornament that comes with it! Again, all of our Stella 12-bottle packs are on sale right now for $2 off, and they come with a free Christmas tree ornament too! See below for pictures of some of the displays at our liquor stores. Happy Holidays and Merry Christmas From Springs Group! From all of us here at the Springs Group - from all our liquor store locations, and from all of our restaurants/pubs - we want to wish you the happiest of holidays and merriest of Christmases. We hope to see you at one of our locations during this season! *Please note that we are NOT accepting empty bottles and cans on December 24th and December 25th. We apologize for any inconvenience, and hope you understand. Thank you, and Happy Holidays from the Springs Group! [post_title] => The Holiday Season Has Hit The Springs Group! 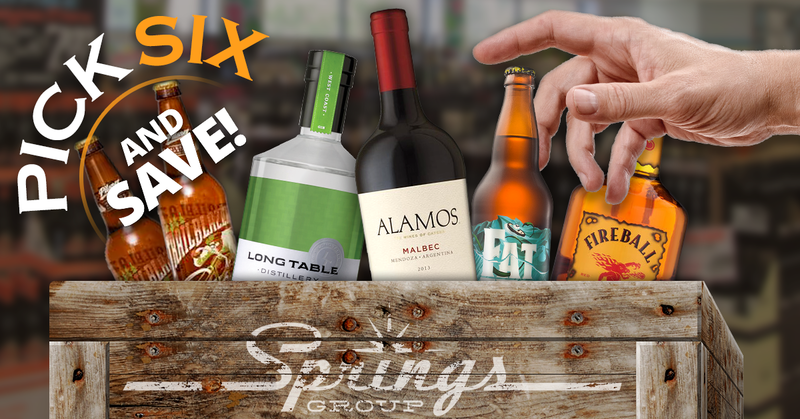 [post_content] => Drop in to any Springs Group liquor store and gather up any 6 bottles of liquor for a sweet 10% discount on the whole batch. Really, it's that easy. Any bottle of booze including wine or liquor in a 750ml or 1.14l bottle and any craft beer bomber over 650ml. Check out these ideas. You could roll into one of our stores and pick a nice bottle of Argentinian malbec, a big bottle of Fireball (of course), a bottle of LongTable gin distilled in Vancouver, a couple Trailblazer Pilsners from Mission Springs Brewery and a Fat Tug IPA from Driftwood Brewery in Victoria. Bring all that up to the till and we'll instantly give you 10% off. The Holiday Season Has Hit The Springs Group!